What drives family loyalty past the point of common sense? When Uncle Gus dies suddenly under dubious circumstances, his family is left with more than just a funeral to arrange. Gus has left a secret will and a family legacy so dysfunctional that the thought of refusing his wishes, even from the grave, is not once considered. 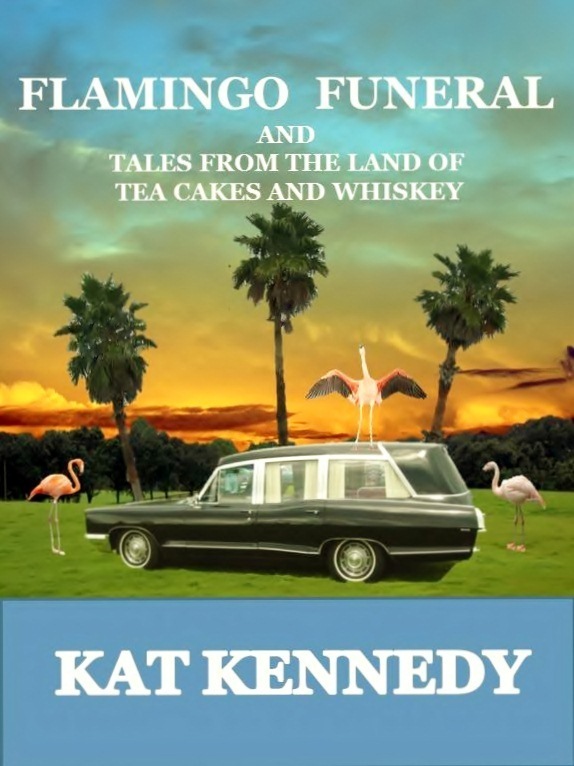 Flamingo Funeral & Tales from the Land of Tea Cakes and Whiskey is not a book depicting the genteel South of mint juleps on the front porch and Southern belles. This is a book of stories about the hard drinking, hard living South. It is filled with characters like the worn and weary Jolene, who discovers being crazy is the easiest job she ever had, and Ree Lambert whose wish to be left alone leads her to do the unthinkable. These stories have a strong sense of of place and grit. As the book description states, they are not stories of the genteel South but come from the other direction. Kat does a fine job of keeping the descriptions, dialogue and direction of the stories true to their Southern heritage. This follows my favorite style of Southern reading and I enjoyed the stories enormously. A slim read, but still worthwhile. and is on Amazon.com in Kindle for the special price of $2.99 from December 13 - January 2, 2013. The paperback will be on Amazon within the week .